Exposure to asbestos is the number one, proven cause of mesothelioma – a terminal disease that currently has no cure. Mesothelioma affects people who work in construction, automotive jobs, shipyard workers, firefighters, power plant workers, industrial laborers, and many other occupations where asbestos fibers and dust are released in the air where they can be inhaled or ingested. Due to the extremely expensive hospital and medical treatment involved, a victim of asbestos exposure who is diagnosed with mesothelioma should seek advice on mesothelioma settlement amounts, which could be used to pay these heavy expenses and protect a family’s financial health. In the 1940s, asbestos was officially recognized and classified as a known carcinogen, yet mining for the material continues even today. Asbestos is still present in some of today’s construction, electrical and maritime products. Weighing the risks, many responsible companies and employers have taken the necessary measures to remove and replace any and all traces of asbestos-related products from their work sites. However, if you have been diagnosed with mesothelioma, you are likely the victim of a negligent company that continued to use or feature asbestos products in their place of business for many years. What factors are considered in your compensation settlement? How do asbestos cases and settlements differ from state to state? Medical diagnosis and related costs: The primary strength of your case rests on your particular diagnosis and all associated health care costs. Personal distress (physical and mental): Mesothelioma brings about enormous pain and suffering, along with stress, anxiety and depression. This negatively impacts one’s quality of life and also has the potential to diminish the body’s immune system and reaction to treatment. Your settlement can, and should, include compensation for the impact of all these injuries including the emotional duress. Lost wages from missed work: Mesothelioma typically robs patients of their livelihoods. The onset of asbestos-related diseases can result in years of missed work and, ultimately, destroy any ability to work in the future as well as cut short your pension benefits. These years of missed work often add up to a very significant amount of money; you deserve to have this lost income repaid in full. Accumulated bills and expenses: Beyond medical costs, expenses from everyday living can also accumulate, particularly, if the mesothelioma patient is no longer able to work. Past due bills, accounts in default, and other debts add up to yet another stressor that comes with a mesothelioma diagnosis. It is the responsibility of the negligent company, who knowingly accepted all associated health risks, to reimburse you for these expenses. The best attorneys for the best settlements: Emotional trauma. Lost wages. Mounting medical costs. The attorneys at Kazan Law understand the enormous impact and toll that mesothelioma takes on victims and their families. Few litigators better understand the hardships associated with asbestos-related diseases, and even fewer have the established track record and required perseverance for obtaining the highest settlements possible. The laws regarding a mesothelioma case are complicated and vary from state to state. Needless to say, it’s important to find an experienced law firm that has intimate knowledge of all the factors involved in asbestos litigation, and with attorneys who hold licenses to practice in multiple states throughout the nation. Ohio: Ohio is another leading state for asbestos lawsuits. These lawmakers reacted by imposing specific restrictions for people filing asbestos lawsuits. 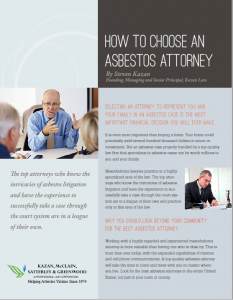 Additionally, the state offers assistance to companies at risk for asbestos lawsuits, which could add additional difficulties to the litigation process. Pennsylvania: Pennsylvania has a long history of asbestos manufacturing, and ranks among the top five states with the highest number of mesothelioma and asbestos-related lawsuits. As more cases made their way into the courtroom, the state introduced a long list of procedures, purportedly to monitor the extensive caseload volume. These extra procedures often delay litigation; consequently, many victims die before their cases come to trial. Texas: Following a high volume of asbestos lawsuits in the late 1990s, the state of Texas passed laws, and its courts made rulings, that impeded asbestos victims seeking justice. Recognized as one of the early pioneers in asbestos litigation, with over 40 years of experience, Kazan Law and its attorneys are knowledgeable about the unique hurdles presented in each state and how to navigate around them for the best results possible. For example, if you live in Iowa, but served the U.S. Navy stationed in California, we would file your case in California, where the laws are more favorable. Or, if you live in Ohio, but the company responsible for your asbestos exposure is headquartered in Los Angeles, we would again file your case here, where the laws are more flexible and better suited for a positive outcome. Juries tend to award more compensation in big cities with booming economies and high costs of living, like the San Francisco Bay Area, where Kazan Law is located. What’s more, partners Steven Kazan and Joe Satterley are licensed to practice in New York and Pennsylvania, respectively– two states representing the lion’s share of today’s asbestos-related caseloads. In addition partner Denyse Clancy is licensed to practice in Louisiana and Texas and partner John Langdoc is also licensed to practice in Texas. Finally, the attorneys at Kazan Law make every client a priority, and demonstrate the compassion and respect that each victim deserves. To begin the legal process of seeking justice and compensation, contact Kazan Law today.